Stress-End™ / 90 Veg Caps - Nature's Way®. Why use a supplement to support an active lifestyle? It provides a convenient source for much-needed nutrients. 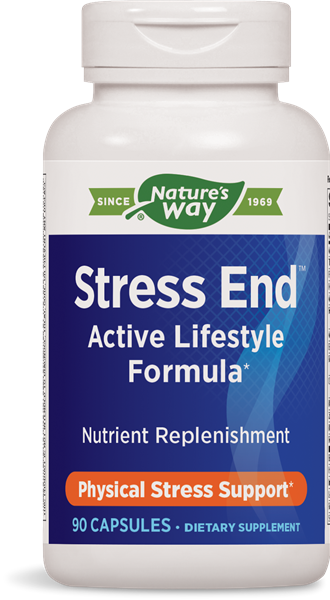 Why use Stress End™ ? Because physical stress can deplete important nutrients. Stress End includes B-vitamins for the nervous system, with nutrients for the adrenal glands (vitamin B6, pantothenic acid, vitamin C, and L-tyrosine). * Key minerals such as calcium, magnesium, potassium, manganese, and zinc are also provided in a base of herbal extracts including valerian, passion flower, and eleuthero. ††Complexed with citrate, fumarate, malate, succinate, and alpha-ketoglutarate intermediates. How does stress cause nutrient depletion? When the body is under stress, it can use up nutrient stores quickly, particularly antioxidants and B vitamins. B vitamins are important for energy production and nervous system function. * Antioxidants, like vitamin C, are needed to help fight increased free radicals caused by stress. * From a more practical standpoint, stress can often affect intake of nutrients by causing poor eating habits. Do not use this product if pregnant or nursing. Do not use alcohol while using this product as it has sedative properties. Do not operate or drive heavy equipment while using this product. If taking sedatives, tranquilizers, any medications, or have high blood pressure, consult your healthcare professional before use.